Saves time, labor and sore arms and shoulders. Use with ALUMABUFF™ to quickly and easily remove stains, streaks and white oxidation from Aluminum pontoons and boats. Buff a 22' pontoon in less than 60 minutes. For more information on how to clean and restore aluminum, visit the ALUMABUFF™ catalog page. Two models available: One for flat surfaces on aluminum boats, One for curved surfaces on pontoon boats. Use With ALUMABUFF™ to Quickly Remove Stains, Streaks and white oxidation from Aluminum. LINEAR BUFFER™ Saves Time, Labor & Sore Muscles. Can you really buff all the stains, streaks and oxidation from a 22 ft. pontoon in as little as 60 minutes? Yes you can, with ALUMABUFF™ and a LINEAR BUFFER™. LINEAR BUFFERS move back and forth in a linear motion so it works parallel to the grain. It cleans and polishes without cutting across the grain, unlike rotary buffers that are designed to be used only on smooth non directional surfaces, such as automotive paint or fiberglass. When used with ALUMABUFF™ and the special ALUMABUFF PADS™ it quickly and easily removes the stains, streaks and oxidation, restoring the original silver finish without cutting and grinding away the top layer of aluminum like old fashioned rubbing compound and metal polish. For more information on how to clean aluminum, visit the ALUMABUFF™ catalog page. AURORA MARINE offers two versions of their POWER POINT PROFESSIONAL QUALITY LINEAR BUFFER. Both are constructed with heavy duty parts to withstand the continuous and rigorous demand and pressure required to buff aluminum pontoons and boats. Both are made with Stainless Steel buffing plates to prevent deformation when pressure is applied and to prevent corrosion. Both have double thick foam buffing blocks to better maintain contact with the aluminum surface. MODEL 01280A: Has a flat buffing block, ideally suited for flat surfaces such as aluminum boats. MODEL 01280P: Has a concave buffing block to maintain full contact with the curved surface of aluminum pontoons. BE SURE TO SELECT THE RIGHT MODEL. Maintaining full contact with the aluminum surface while buffing will insure better results, less time and effort buffing and fewer replacement ALUMABUFF PADS™. The POWER POINT LINEAR BUFFER™ is an air operated buffing machine that requires compressed air from a compressor. It requires 90 psi, but can run on slightly less. Most portable compressors with a 3 to 5 gal tank and 100 psi, or larger, are adequate. The POWER POINT LINEAR BUFFER™ has a 15 ¾” buffing block that operates back and forth in a linear motion, moving approximately 1 inch at up to 3,000 strokes per minute, free speed, and slower under pressure. It has dual cylinders to eliminate dead spots and stalling and operates at low noise and vibration levels. The back and forth linear motion is important as it follows the grain to clean the stains and streaks without cutting across the grain which removes a layer of aluminum. With a little practice controlling the speed and pressure, you should be able to restore your aluminum pontoon or boat in one pass. Heavily oxidized aluminum may require repetition until the aluminum is bright and shiny again. The POWER POINT LINEAR BUFFER™ uses a Velcro Hook Strap mounted to the pad assembly to accommodate the special ALUMABUFF PADS™ that are designed for optimum efficiency when used with ALUMABUFF™. The pads with the special micro fibers, cleans the surface as well as getting into the recesses to clean them as well. ALUMABUFF™ contains HYPEXINE™, a special leaching agent that brings the stains to the surface so they can be easily and quickly removed. Removing streaks, stains, tarnish and oxidation from aluminum is fast, easy and much cleaner with this system. It can reduce the time it takes to restore your aluminum by 90%. The POWER POINT LINEAR BUFFER™ uses a Velcro Hook Strap mounted to the pad assembly to accommodate the special ALUMABUFF PADS™ that are designed for optimum efficiency when used with ALUMABUFF™. The pads with the special micro fibers, cleans the surface plus it gets into the recesses to clean them as well. ALUMABUFF™ contains HYPEXINE™, a special leaching agent that brings the stains to the surface so they can be easily and quickly removed. Removing streaks, stains, tarnish and oxidation from aluminum is fast, easy and much cleaner with this system. It can reduce the time it takes to restore your aluminum by 90%. ALUMABUFF™ is water based and free rinsing so it’s not necessary to degrease the surface prior to applying ALUMETRON™ clear coat. Just rinse it clean with a pressure washer or garden hose and brush. Quickly & Easily Removes Stains, Streaks & Oxidation. Cleans & Polishes without cutting across the grain. Restores Aluminum to its original Silver Finish. ALUMABUFF is the best way to clean aluminum and polish out the stains, streaks and white cloudthat plague pontoon boats.It’s water based and free rinsing so the restored surface is ready for a protective coating like ALUMETRON™. You don’t have to remove the residual wax, silicone or oil left behind by traditional aluminum polish or rubbing compound. It can be used by hand or with a LINEAR BUFFER™ (Recommended) to save time and labour. It’s formulated to remove stains, tarnish, white streaks, oxidation, corrosion and cloud from mill finished aluminum quickly and easily, without the necessity of messy and dirty aluminum polish or rubbing compounds. Aluminum pontoons can be cleaned and polished in less time and with less material. You save time, labour and money. Pontoon boats look amazing when they are shiny and new. Regrettablythe aluminum pontoons begin to streak and stain from the water and atmospheric, pollutants. The questions that pontoon boat owners constantly ask are: 1. How to polish aluminum? 2. How to clean aluminum? The traditional way of cleaning aluminum and polishing aluminum with corrosive aluminum cleaner and abrasive aluminum polish is hard, dirty work and takes a long time. ALUMABUFF works both chemically and mechanically. When you use it with the special ALUMABUFF PADS and a LINEAR BUFFER, it quickly restores the aluminum pontoons to their original appearance. Even expensive triton pontoon boats and luxury pontoon boats will lose their value if the pontoons are corroded, streaked and stained. Shiny, silver colored pontoons can easily add 10% or more to the value of your pontoon boat and let, you enjoy greater pride of ownership when your boat looks ship shape. The best way for polishing aluminum and cleaning aluminum pontoons and aluminum boats is with ALUMABUFF. The HYPEXINE leaching agent in ALUMABUFF pulls the stains to the surface, where they can be rapidly stripped away with the special ALUMABUFF PAD so you don’t have to spend days grinding away the surface. Ongoing maintenance much easier when the restored surface maintains the mill finish your pontoon boat had when it was new. A beautiful pontoon boat with dirty, stained, streaky pontoons is like a beautiful automobile with rusty wheels and bald tires. It’s just wrong. When chemical cleaners and brighteners fail to restore that silver look to your pontoons, the only solution is to buff out the stains and corrosion. The problem is, using old fashioned rubbing compounds or metal polish is a dirty, expensive and very time consuming job. It can take 20 to 30 hours of hard labour. That’s why no one wants to do it and that’s why boat detailers charges thousands of dollars to do this job. Ouch! But now, there is a better way. Today, we're going to show you how easy it is to buff the stains and streaks from a 22 foot aluminum pontoon, in under 60 minutes. We’re going to use ALUMABUFF and a LINEAR BUFFER to remove the stains, streaks and oxidization and restore this pontoon. The challenge is to get it done in 60 minutes, or less. Buffing a pontoon like this, using old fashioned compounds and metal polish, can take 10 hours, or more. Our Challenge is to get it done in only 1 hour. Can we do it? First we prime the pad. Next, we apply ALUMABUFF to a 3 to 4 square foot area. Now, start the buffer and place it on the pontoon. Apply pressure and work the buffer from the top to the bottom. Adjust the speed and pressure as you move the buffer, so that you remove all the stains in one pass. Continue along the length of the pontoon, overlapping slightly. ALUMABUFF is easy to use and it will save you a ton of time and money. Anyone can get professional results with a bit of practice. Getting a friend to help makes the job go faster. Buffing with metal polish or rubbing compound is harder, more time consuming and really dirty work. This is better faster and easier. Buffing out the dents and recesses takes a little extra time and may have to be done by hand. A quick rinse and we’re done. All of the stains, streaks and corrosion are gone and the pontoon is restored to its silver appearance. We did it. All the stains, streaks and corrosion are gone, in under 60 minutes. That was easy and Fun. For more information and to buy Alumabuff, ask your pontoon dealer or visit our Website. You can now coat your restored pontoons with Alumetron to keep them clean and shiny for up to 5 years. We recommend protecting your pontoons below the waterline with VS721, to reduce future attachment of marine growth and to make clean up easier. 1. Can I use other buffing pads or materials with ALUMABUFF. No. Other materials will not work efficiently with ALUMABUFF and may cause damage to the aluminum. These pads were specially engineered to work with ALUMABUFF. 2. Can I use a rotary or orbital buffer instead of a Linear Buffer? 3. Can I use ALUMABUFF by hand or do I need a Linear Buffer? You can use ALUMABUFF by hand but it takes much longer. We highly recommend a Linear Buffer. A linear buffing machine and the proper pad will save you a lot of time and labour. A Linear Buffer moves back and forth at up to 2,500, 16 inch, strokes per minute. How long would it take you to move your hand back and forth in 16 inch strokes?A machine will also give you more even, consistent results. If you decide to do it by hand we recommend using a MARINE POWER MITT™. 4. Is ALUMABUFF the same as a rubbing compound or metal polish? No. ALUMABUFF is a chemical cleaner that uses mechanical buffing as a cleaning aid. Rubbing compounds and metal polishes are designed to cut away the stained or oxidized surface to reveal a new surface, but this changes the appearance of your marine aluminum. 5. Buffing aluminum generates a black residue that goes all over the place and is hard to remove. Does ALUMABUFF do that? No. ALUMABUFF is water based and does not remove so much of the metal so the black residue is much less and is contained on the surface and on the pad. 6. Why does ALUMABUFF work so much faster than rubbing compound? Rubbing compounds and sandpaper or metal polishes are highly abrasive and are designed to grind away and remove the surface layer of the metal. Grinding and polishing is tedious labour intensive work. ALUMABUFF is a chemical cleaner with a buffing aid to accelerate the cleaning action. 8. Aurora Boat Care Products are guaranteed to work Is ALUMABUFF guaranteed? Yes. 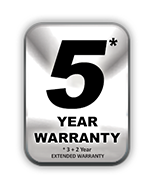 When used as directed, All Aurora Boat Care Products are sold with a 100% Customer Satisfaction or Your Money Back Guarantee. You can use all of our products with complete confidence. 9. I don’t want to do the work myself. Are there people that can restore my pontoons with ALUMABUFF? Yes, Ask your pontoon boat dealer. The will be happy to help you out and they have the equipment to lift your boat off the trailer so they can get underneath. If they’re not familiar with how to use ALUMABUFF they can call Customer Service at 1-866-214-3444 for help and technical advice. 10. My pontoon is on a trailer. How can I get between the bunks and pontoons to clean that area? 11. How much ALUMABUFF do I need for a 22 ft. pontoon boat? 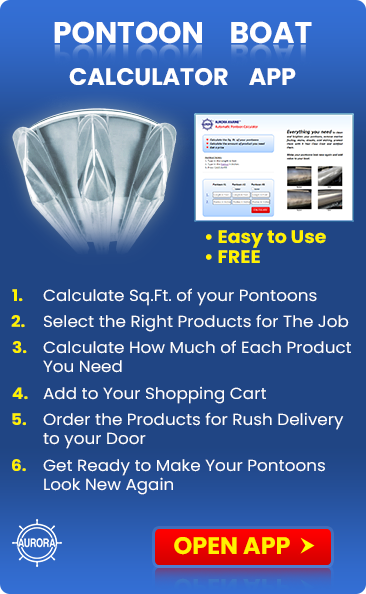 An average pontoon will require 1 bottle per pontoon. If it’s really badly stained or heavily oxidized or oversized, you may need more. 12. How often do I have to clean my pontoons with ALUMABUFF to keep them looking new? Depending on how you maintain them. Staining, streaking and corrosion is caused from use of improper chemicals or pollutants in the environment. Use only cleaners and protectors recommended for aluminum and wash them on a regular basis to keep them looking new. You can also coat them with ALUMETRON™and that will protect them against environmental damage and staining for up to 5 years. 13. What can I use to protect my pontoons so that I don’t have to clean them all the time? ALUMETRON™will keep them looking shiny and new for up to 5 years, even in salt water. 14. Will ALUMABUFF remove algae from the bottom of my pontoons? No. Use ALGEX™first to remove the growth. 15. My boat lives in the water. How can I stop marine growth from attaching to the bottom of the pontoons? Apply VS721 at the beginning of each season. It’s perfectly clear and makes it difficult for algae to attach and Zebra or Quaga Mussels can’t attach. Many areas prohibit the transport of boats from a contaminated body of water to their lakes in order to prevent the spread of these invasive species. 16. What is the shelf life of ALUMABUFF? 17. Is the ALUMABUFF finished surface difficult to maintain like highly polished chrome finishes? No. It restores the original factory finish. 18. Is ALUMABUFF environment friendly? Yes. It’s water based, biodegradable and does not contain petroleum distillates or VOC’s. 19. What is the recommended temperature to use ALUMABUFF? The ideal temperature is between 50°F and 75°F. If too cold it becomes sticky and hard to work and if too hot it dries too quickly requiring constant spraying with water. It’s also best not to do this in direct sunlight. Early morning or late afternoon or evening are best. 20. The directions say to keep ALUMABUFF damp. What happens if it dries on the surface? If ALUMABUFF dries out, the chemicals stop working and you are left using only the buffing aid. This will over polish the metal. Keep a spray bottle of water handy and moisten it when required or apply fresh ALUMABUFF. Do not skimp on ALUMABUFF. Let the chemical do the work for you. 21. Are replacement ALUMABUFF pads readily available? Yes. We sell them in a kit of 3 replacement pads. 22. There are some areas under the deck and around the nose cone where I can’t get the buffer in to do the work. How do I clean and restore those areas? Areas that are inaccessible with the buffer will have to be done by hand. We recommend using a MARINE POWER MITT™for any hand work. It saves time and labour and will give you more consistent results. 2. Make sure the Trigger is in the "OFF" position when connecting the tool to the air supply. 3. Use normal 90psi (or ranging from 6.0 to 8.0kg) air pressure while running the tool. 4. Drain the air tank daily. 5. Clean the air inlet filter cartridge weekly. 6. Line pressure should be increased accordingly to make up for extra long air hoses(usually over 25 ft/8 meters). The minimum hose diameter should be 1/4". 7. Use proper hoses and fittings. 8. Keep hoses awayf rom the heat, oil and sharp edges. Check hoses for wear before individual use. Make certain that all connections are secure. 1. Approved eye protector must be worn at all times. If necessary, 0. ear protector & gloves should be used. 2. Always keep good balance of body & footing. Secure work with 0. clamps if necessary, so both hands can be free to operate the tool. 3. Be sure all clothing is tight to prevent entanglement with 0. 0. running tools. Remove jewelry and watch for safety purpose. 4. Be sure that working area is clear of foreign objects and that no people are within immediate access to tool operation scope. The working place shall be well ventilated. 5. Disconnect the air hose before changing or adjusting Pads or Loop. 6. Be sure that Tool is in "OFF" position before connecting to the air hose. 7. Disconnect the tool when it is not in use. 8. Never carry tool by the hose. 1. If you are not using an airline oiler, lubricate the air motor by applying 4 to 5 drops of SAE #10 lubricant or sewing machine oil in the air inlet and in the side oil port, prior to 1st use and prior to each use thereafter. Do not use Detergent Oil. 2. Oiling in the air inlet is necessary every 1 hour of continuous operation. 3. After operation, take off the airhose and pour 4 or 5 drops of #60 spindle oil into the air inlet, then connect the hose again to run the tool for a few seconds. This will prolong the tool life. 4. Clean air inlet filter cartridge on the airline weekly. 1. Never use the tool in potentially explosive atmospheres. 2. Keep your body in well balanced position and always wear gloves to reduce the risk of crushing caused by torque between the reaction bar and work piece. 3. Unexpected tool movement due to reaction forces may cause injuries. 4. Prevent long hair or loose clothing from drawing in while operating the tool. 5. The Noise (sound pressure level) at the workplace may exceed the normal standard ---usually 85dB(A). In this case, quality ear protector should be used. 6. Slip/Trip/Fall is a major cause of serious injury or even death. Be aware of excess hose left on your walking way or on the working surface. 7. Continuous operation and bad working condition can injure hands. If hands become numb or aches or if a serious symptom occurs, operator shall see a doctor immediately. Pad Size: 15.75" x 2.75"